Jama Masjid dates back to the late 16th century and was built by King Adil Shah Farooqi over the course of 5 years. 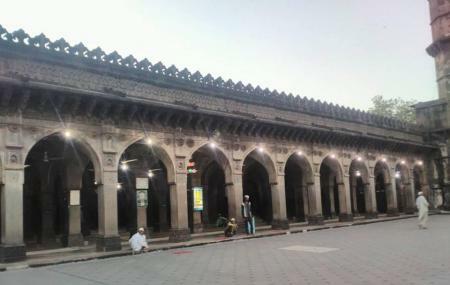 The present day Jama Masjid is the second in Burhanpur- the first being constructed by Begum Ruquiya (wife of King Azam Humayun) in 1539. The Jama Masjid does show quiet a close resemblance to the Jama Masjid in Delhi and is loved for its architecture. Owing to its vast history, the place is a historic monument as well as a worshipping place. Stop by to admire the interiors of the Masjid. How popular is Jama Masjid? People normally club together Balapur Fort and Asirgarh Fort while planning their visit to Jama Masjid. Sukun milta h jama masjid me. Best architecture. One of the best architecture marvel from faruqi dynasty, this entire structure is having no separate roof but a intersection of archs, a must visit site for every tourist. Great place for Namaz. It is Farooqui construction, built by Aadil Shah Farooqui. It is the most popular Landmark situated in Central city.